General: Frequently Asked Questions - GoldSilver Central - Your one stop Gold, Silver and Platinum solutions provider! 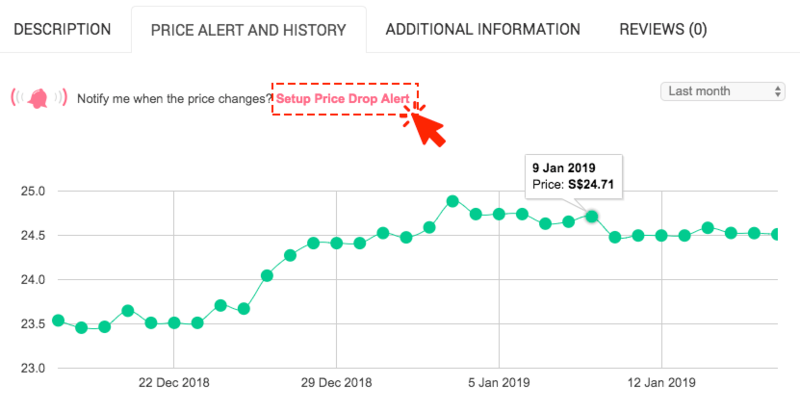 Can I set Product Price Alerts for my desired Price? 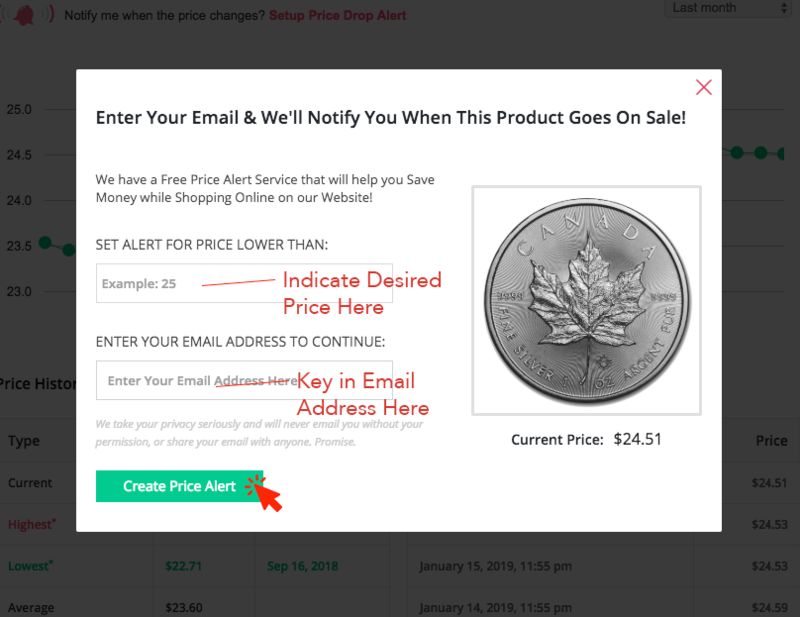 Step 4: You will get a confirmation pop-up and receive an email once the price drops to your indicated price. Is there a minimum amount or weight that I have to order? 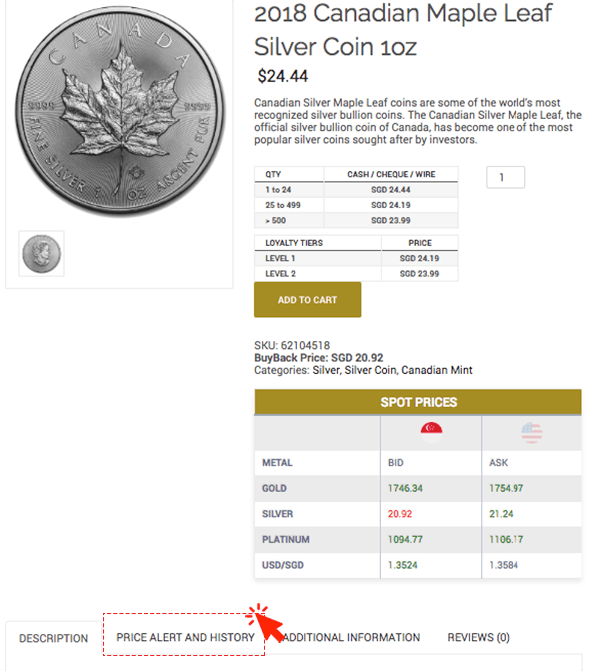 No, there is no minimum quantity or weight needed before you place an order with GoldSilver Central (GSC). Is there a maximum amount or weight that I can order? Yes, there is a maximum amount of both gold and silver that you can order online. For silver, it is 500oz and for gold, it is 200 grams. For orders above these quantities, please contact GSC to speak with one of our staff or purchase it in our office during office hours. Why is the final price quoted higher than the one initially seen at the store? Prices are based on a live market spot price hence there is a possibility that the bullion price has increased. Prices will only be locked in when you confirm your order. There are different ways of getting a refund for your GST depending on how you are leaving Singapore. If you are leaving Singapore by air from Changi Airport, you can get your GST Tax Refund via Premier Tax. You may purchase over the counter from us and collect the tax refund immediately at the airport. However, you will not receive the full 7% refund from them as they will charge a service fee. Most of the time you will be able to receive about 6.2% of the purchased value back. Can I cancel an order after I have submitted the order? 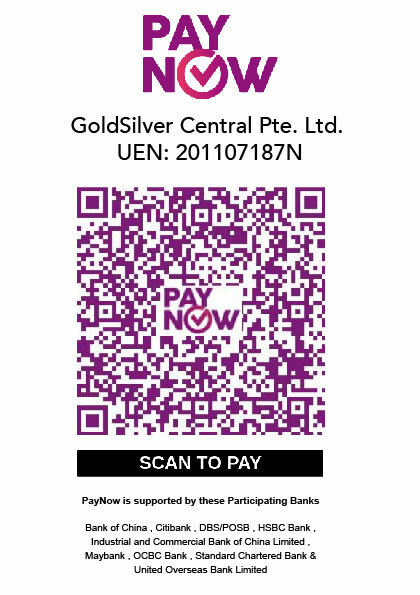 Once an order is submitted and a confirmation number (invoice number) is given, the transaction is valid and it may not be cancelled unless the individual is willing to bear the difference in the ask price based on our current ask price, if any, and an additional SGD$50.00 cancellation fee which is subjected to GST. Any market gain in price will not be refunded. There is a admin fee of SGD$50. Once an order is submitted and a confirmation number is given, the transaction is valid and it may not be cancelled unless the individual is willing to bear the difference in the ask price based on our current ask price, if any, and an additional SGD$50.00 cancellation fee. Can you deliver the bullion we ordered to us in Singapore? At the moment, we do not deliver the bullion to clients. All orders have to be collected at our office. However if you order a huge amount of silver from us and require our assistance, please give us a call and we will see how we can assist you in this. Can you ship gold or silver to us if we are foreigners and reside overseas? We are able to ship gold and silver abroad, however at additional shipping and insurance cost. Please note that full payments have to reach us via telegraphic bank transfer within 2 business days before we will ship the bullion out. Please call us to enquire as we also do have gold and silver stocks in a bonded warehouse. This allows you to purchase gold and silver without the goods and services tax if you reside overseas or have a bonded warehouse in Singapore. Can I make a purchase and collect it later? Collection can be made anytime after the order has been paid for. Please inform us at least one business day in advance before collection. Once the order is made, the full payment has to be wired to us within two days. Where can I store my bullion? You can store your bullion with us under our storage program at Le Freeport. Click here to be directed to the link. Why do you need my Name and Address on my Invoices? For purchases on GST Exempted Gold, Silver and Platinum Coins and Bars, we would require the customer's Name and Address on the invoice. This is a requirement set by IRAS (Inland Revenue Authority of Singapore) under the Invoicing Requirement for an exempt supply of IPM. More details can be access via IRAS e-Tax Guide. This link will take you to the 8th Edition (Published on 18 Jan 2019). Bank Transfers are processed within our Operating Hours (Monday to Friday: 10am to 5.45pm. Saturday: 10am to 12.45pm). Transfers done outside of our Operating Hours will only be processed on the next business day. We do require 2 business days for Telegraphic Transfers. *Please take note that the time taken to check for transactions done on Saturdays might take longer and we do advise clients to make payments before Saturday where applicable. Citibank Credit Card Singapore Holders can choose to pay for their Gold, Silver and Platinum purchases via a 6-month, 12-month or 24-month interest-free instalment plan* at our retail store. All you have to do is inform us at our retail store that you would like to opt for the 0% Instalment Payment Plan and charge your Gold, Silver or Platinum purchases to your Singapore-Issued Citibank Credit Card (for VISA and MasterCard Only). Cards must be Citibank Issued Cards. Citibank Issued Debit or ATMS Cards are not applicable for this 0% Interest-Free Instalment Plan. The minimum spending amount required for the Instalment Plan is S$500.00. When do I make payment after placing an order? Payment must be made within 2 business days after you have received an order confirmation email from GSC. Payment details will be sent to you via email upon order confirmation. Payment not made within 2 business days may be cancelled without notice and the customer will be subjected to our market loss policy including an admin fee of $50. Note: GSC reserves the right to refuse or cancel any order in the event that GSC is unable for whatsoever reason to procure any or adequate bullion to satisfy your order, or if customer payment is not received within the Payment Timeframe specified, or when the confirmed price is incorrect, whether due to computer-related problems or otherwise, pricing error or sudden movements in the precious metals market or export/import restriction. Furthermore, we reserve the right to refuse or cancel any order deemed questionable, suspicious or of significant risk to GSC regardless of payment method and price confirmation. Is GST being included in the final prices? Can I place an order online if I am a foreigner and do not have a local address? GSC will need an estimated 30% of the amount of the bullion you are about to order as a deposit before you may place an order online with us for fix a price with us over the phone. If an order is placed online and you are not a Singaporean and do not have a local address, your order will not be valid and accepted by GSC unless you have placed a deposit with us prior to the order. Orders placed with a deposit has to be fully paid up and collected within 3 weeks from the time the order is fixed. If I were to make a cash payment, am I bounded for The Corruption, Drug Trafficking and Other Serious Crimes (Confiscation of Benefits) Act? From 15th October 2014 onwards, customer with cash payment of S$20,000 and above (or its equivalent in a foreign currency) regardless of the number of transaction within 24 hrs will be bounded by the act and is required to provide the information and documents required. What are the information/documents that I am required to provide if I make cash payment for S$20,000 and more (or its equivalent in a foreign currency)? occupation, for an individual, or business, for a body corporate or unincorporated.